This is part two in a three-part series on the history of the Traffic Circulation Plan (TCP) in Groningen, Netherlands. Part one is here, and part three is here. The content was originally an assignment for History & Theory of Urban Planning at the University of Illinois at Chicago, where I am a master’s candidate in the College of Urban Planning and Policy. I’d like to thank Lennart Nout and Chris Brundlett at Modacity for their input and resource-sharing. I’d also like to thank Vincent Ziols who also contributed to the paper. The main objective of the TCP was to create barriers for cars in order to block access to the inner city streets. This would substantially increase the right-of-way for pedestrians, bicyclists, and transit riders while minimizing safety conflicts with automobiles. The TCP would effectively divide the city into four sections, and, along with the rerouting of city streets, prohibit automobiles to cross over between sections. Cars would be limited to few access points into the city, but would be offered an expanded road way that encircled the outer neighborhoods of the city. Figure 1 illustrates the evolution of the ‘ring-road’ network, which was intended to mitigate the traffic created by the block of access through the city center. Arterial road structure for car traffic, approx. 1964, 1980 and 2000. Image courtesy of CROW Fietsberaad. Upon the council adoption of the TCP in September 1977, Van Den Berg and city staff were ready to move forward with implementing the plan. On the night of September 19th all 5,000 steps of the TCP were implemented; such a strategy may have arisen out of the need to thoroughly execute the plan, if not to mitigate conflict or opposition. City staff presented flyers and flowers to confused commuters who could no longer cross through the center of the city. After the initial implementation, new bicycle paths were created, trees were planted in now open streets and other development measures of the TCP took place which helped to bolster the effects of the new network system. A city official distributes flyers and flowers to motorists, September 1977. Image Courtesy of Groningen ImageBank. Overnight implementation resulting in a substantial neck-down of motorized traffic. Image courtesy of Pellenbarg, 2003.
Business owners react to the TCP rollout. Image courtesy of Karsijns and Schilt, 2003. Reports were produced indicating a loss of business, and proposals to modify the TCP were submitted. Additionally, central city businesses submitted a suspension request with the Council of State which included proposals to revert elements of the TCP-affected streets back to their previous condition. The council overruled the suspension request, stating that the shopkeepers did not provide sufficient evidence of a decrease in sales. Citizen Participation: inspraak or participatie? Van Den Berg was one of many young PvdA members who initially advocated for improved accessibility, transparency, and responsiveness between citizens and municipal administrators. He once proposed the creation of neighborhood councils and the appointment of city officials to assist citizens through municipal policies and practices. Despite such participatory concepts being espoused by Van Den Berg and other PvdA members, there is little evidence to support the notion that citizens were actually involved in either the creation or implementation of traffic policy reforms. Shinji Tsubohara and Gijs Van Maanen distinguish between the use of the words inspraak and participatie in PvdA plans. Inspraak is used to denote situations where citizens are merely asked to provide input on a specific topic, whereas participatie describes the citizen as actively involved and integral to the decision-making process. The PvdA’s 1982 Residential Traffic Plan gives further application on the concepts; Inspraak occurs through a series of public hearings and written submissions on the plan, while participatie can happen as the plan is developed in the context of one’s specific neighborhood. Although these concepts appear to align with the objectives of the PvdA in general and its younger members in particular, they become arguably inconvenient or irrelevant to Van Den Berg through the development and implementation of the TCP. 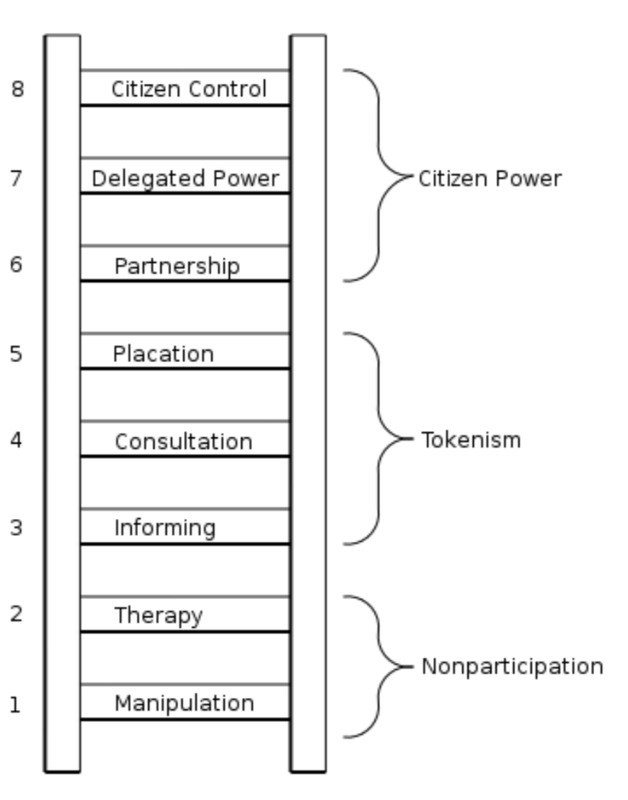 Arnstein’s ladder of citizen participation. Courtesy of Arnstein, 1969. Shinji Tsubohara places the PvdA’s citizen participation efforts within the ‘tokenism’ rungs of Arnstein’s ladder. The mandated public hearings scheduled with little time for plan review could be construed as ‘informing’, a one-way attempt to disseminate plan content with little opportunity for citizens to contribute. Inspraak aligns with Arnstein’s concept of ‘consultation’; although the opportunity to give input may exist, the likelihood that such input will be considered or acted upon is minimal. Given the strong opposition of the central city shopkeepers and the advent of such concepts as communicative planning, the prospects of implementing a large-scale plan like the TCP today is unlikely. Newer PostThe Traffic Circulation Plan, Continued: Evolution, Current Strategy and Challenges.